The other day I wrote about how picturesque the Dubai Sports City Cricket Stadium is and showed some of the pics of the stadium before and after the completion of the construction. Dubai's community has give the ground a nick name - The Ring of Fire. The following views from the inside and outside will tell you why. 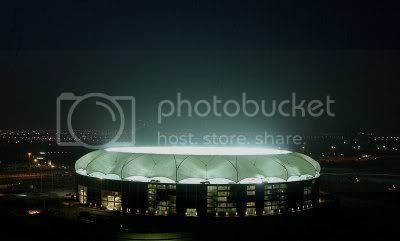 The Ring of Fire is ready to host Pakistan and Australia! what do you think is the likelihood of the Pak / NZ series in Nov-Dec taking place in Dubai? With the current of state of affair in the Pakistan, I say the likelihood of that is extremely high. 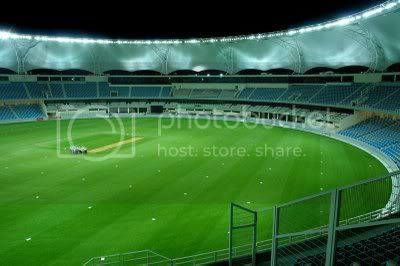 I dont see any cricket in Pakistan for atleast 2 years..
Having said that, the pitches here in the UAE are not fit for test cricket.. maybe the new Dubai one is but the AD one is surely not and Sharjah cant host matches so who knows where they shift that series..
Q, ground looks superb, Whats the capacity. Looks pretty big, is it around 100k ?